Antiques have been popular in France. French people treasure the old and good customs. Parisian are sensitive to fashion. 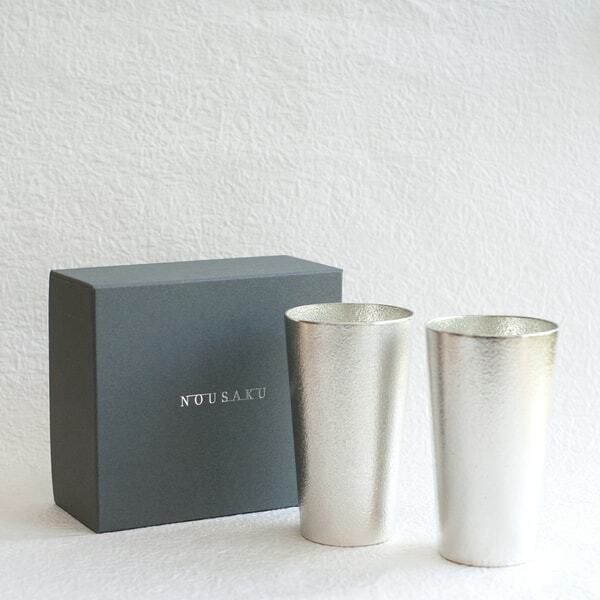 In fact, fashionable Parisian love Japanese “Nanbu tekki”, or Nanbu ironware. 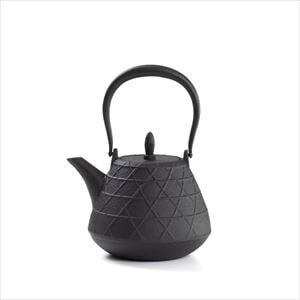 Tetsubin (iron kettle) of Nanbu tekki has sophisticated beauty. 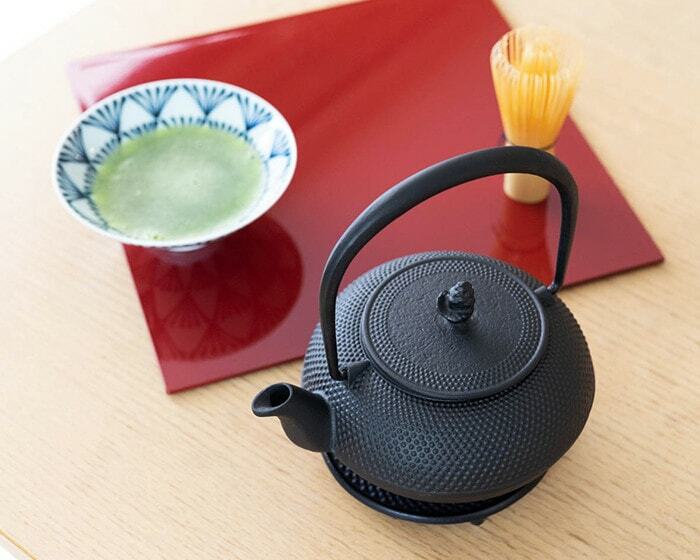 Tea salons in Paris serve their tea with Nanbu tetsubin. Nanbu tekki and Nanbu tetsubin have 900-years’ history. It is traditional craft in Iwate prefecture. People have grown and inherited the Nanbu tekki in their life for a long time. Have you ever heard that “hot water boiled by Nanbu tetsubin is mellow and delicious”? 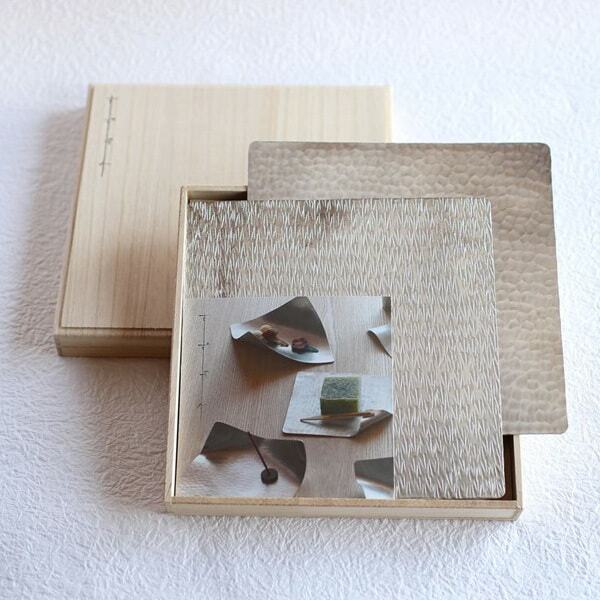 We would like to introduce the fascination of Nanbu tetsubin of Roji Associates. The scenery with Nanbu tetsubin of Roji reminds us the inherited life of Japanese people. 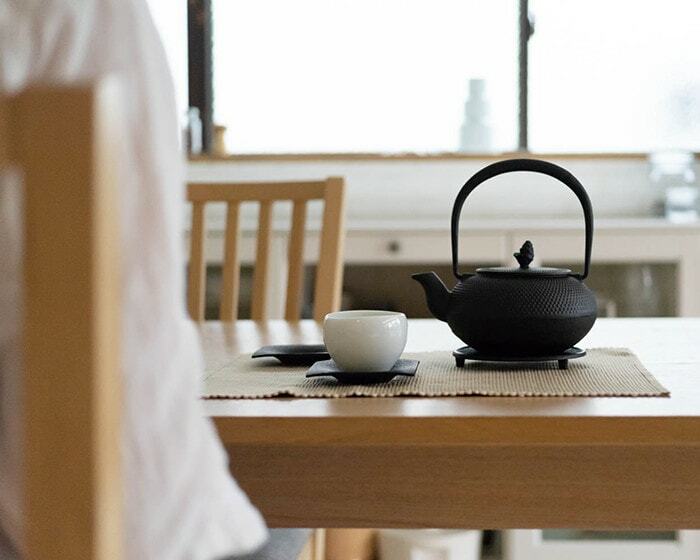 Nanbu tetsubin was born from culture of tea ceremony. Hosts entertain guests with tea in tea ceremony, or Chanoyu. 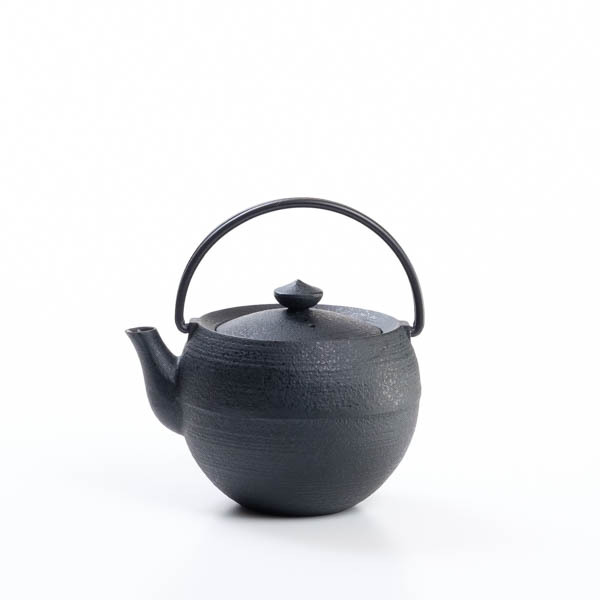 Nanbu han (feudal clan) of Iwate prefecture originally produced caldron for tea ceremony. The lord of Nanbu han invited craftsmen from Kyoto and made them produce caldrons with good iron produced in Nanbu han. That is the start of Nanbu tekki. Sencha became boom in the middle of Edo era (about 18C.) 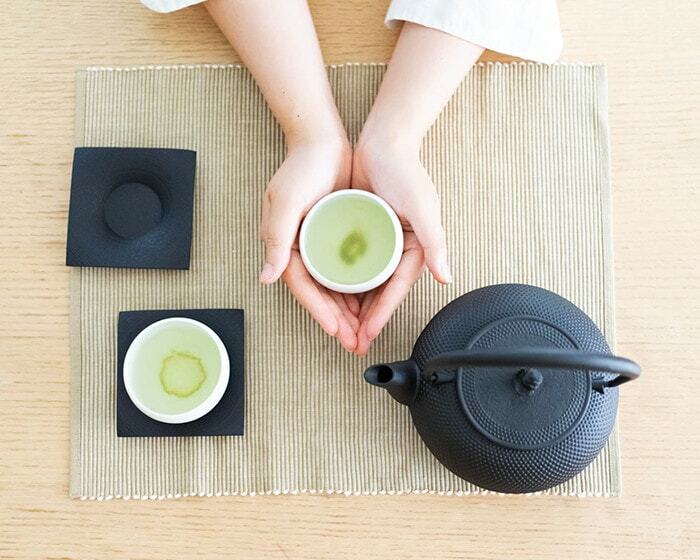 Sencha is more casual way to enjoy tea. 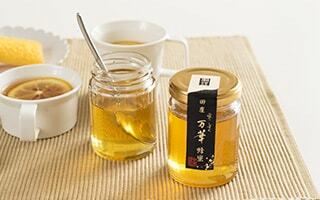 For Sencha, craftsmen of Nambu tried to produce tetsubin. 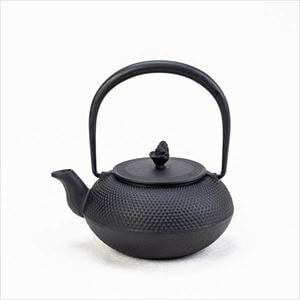 “Make caldron smaller so that it can be lift.” “Put spout and handle to pour easily.” That was the beginning of producing Nanbu tetsubin. 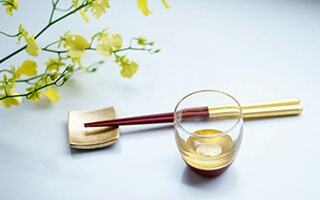 The spirit of “Wabi & Sabi” and entertaining guest (Omotenashi) are important in Japanese tea ceremony. Nanbu tetsubin of Roji inherits those spirit. Please enjoy the solidity, jet-black sheen, and gentle form of Nanbu tekki by Roji. The surface of casting differs from producing areas or casting studios. 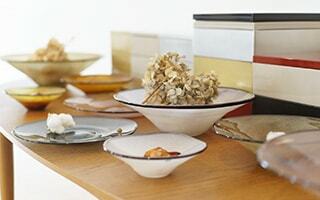 The surface of Nanbu tetsubin from Roji is “Arare” pattern, that is gradation of various rounded projections. Arare pattern is one of the representative patterns of Nanbu tekki. Many caldrons in tea ceremony had this Arare pattern. Therefore, Nanbu tetsubin inherited the pattern. Only skilled mold craftsmen can produce the beautiful line of Arare pattern. The Nanbu tetsubin of Roji has the Arare pattern on its lid and body. 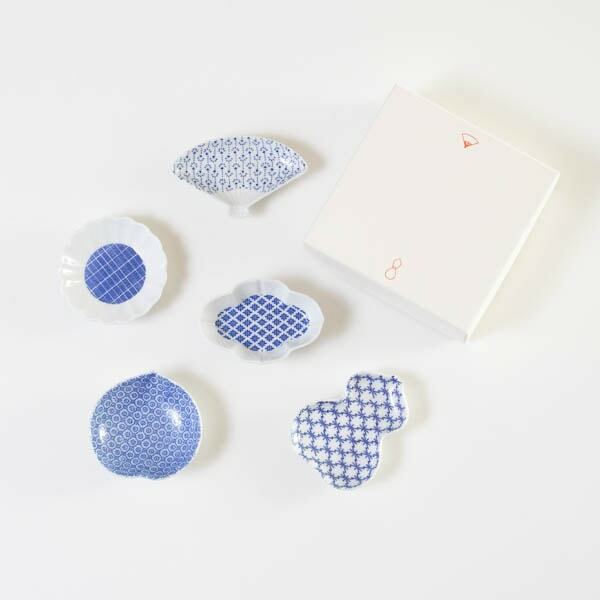 If you would like to start using Nanbu tekki, how about choosing stylish and traditional Arare pattern? Please look at the knob of lid of the Nanbu tetsubin of Roji! The design of knobs differs from regions or craftsmen. Nanbu tetsubin of Roji has cute small pinecone. The pinecone knob is a cute accent on the stylish tetsubin. This is the most attractive point of Nanbu tetsubin. If we can make water delicious, we can make delicious tea or coffee, of course, and delicious dishes every day. Even instant soup or ramen become more delicious. When you would like to cook a simple dish, use the hot water boiled by tetsubin of Nanbu tekki. Why hot water becomes delicious? As we boil water with Nanbu tetsubin many times, inside of the tetsubin is furred. This “fur” is one of the components of water. White fur adheres to the inside of tetsubin. The fur piles as we use Nanbu tetsubin. The layer of fur becomes stronger. The fur is chlorine and calcium in the water. 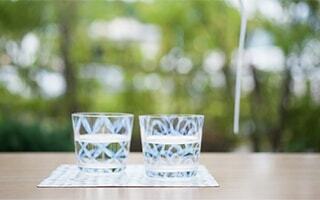 When we boil water by Nanbu tetsubin, the harsh taste of chlorine is removed. That’s why the hot water boiled by tetsubin is delicious. 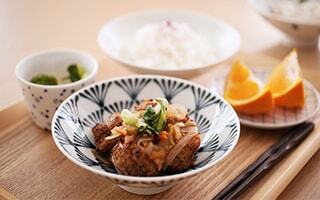 With this Nanbu tetsubin of Roji, you can drink delicious tea and eat delicious dishes every day. 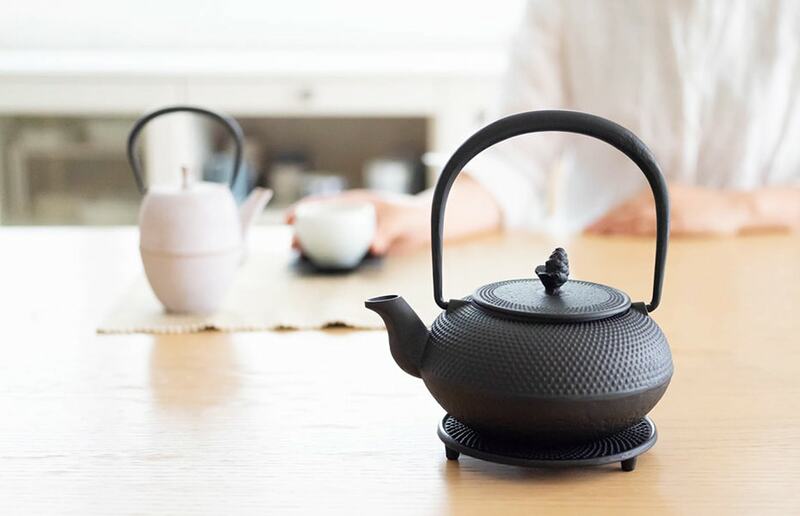 If you care about your health, and pursue the stylish lifestyle, Nanbu tetsubin of Roji is the one you need. The tips of better use of Nanbu tetsubin is growing fur as early as possible. The fur adheres inside the tetsubin makes fine layer for 10 days to 2 weeks. This is “shakedown period” for the tetsubin of Nanbu tekki. 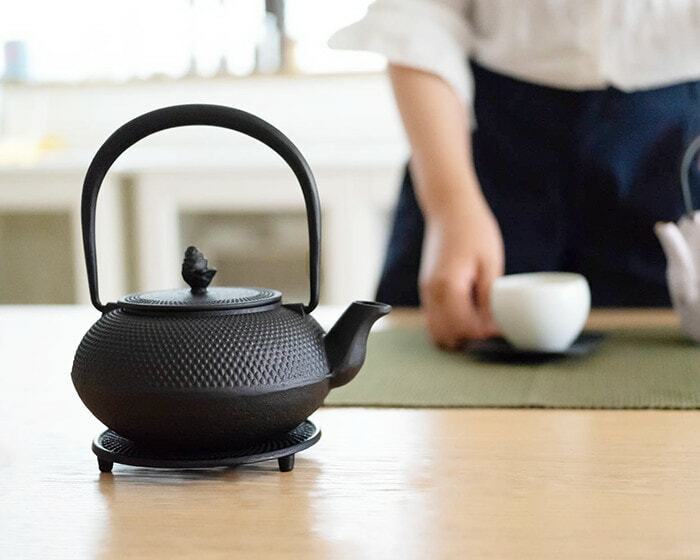 We recommend using the Nanbu tetsubin every day during the shakedown period. After use, please dry the tetsubin well. The more you use the Nanbu tetsubin, the more you get fond of it. Please enjoy growing your tools for your life. 1st day: Dust inside the tetsubin is cleaned, and we can see gray coat. 3～4th day: Brown polka dots or lines appear in places. 7th day: The brown places blur and broaden, and the color fade. 10th day: White coat appears slightly in the whole inside of tetsubin. 15th day: Fur begins to appear like white powder around the gray or brown places. After 15th day: Yellowish, brownish, or blueish white fur is piled depends on the quality of water. The hot water boiled with Nanbu tetsubin is not just delicious water. In fact, the hot water boiled with Nanbu tekki includes necessary iron for our body. Erythrocyte or red blood cell takes roll of delivering oxygen in human body. The hemoglobin in the red blood cell composed of iron. If the iron is not enough, people feel anemic. 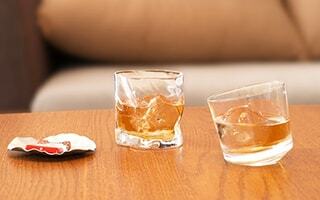 It is said that 1 in 5 people tend to anemia nowadays. In particular, women tend to lose iron. So, Nanbu tetsubin is an easy and helpful item to take iron. 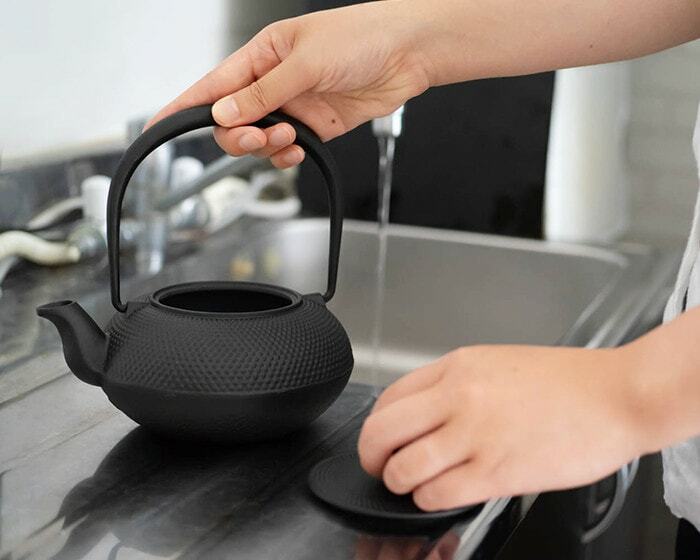 When we boil water in Nanbu tetsubin, the tetsubin removes chlorine or calcium of water, and supplies iron slightly. It is same when we cook dishes with iron pan. We boil water every day. 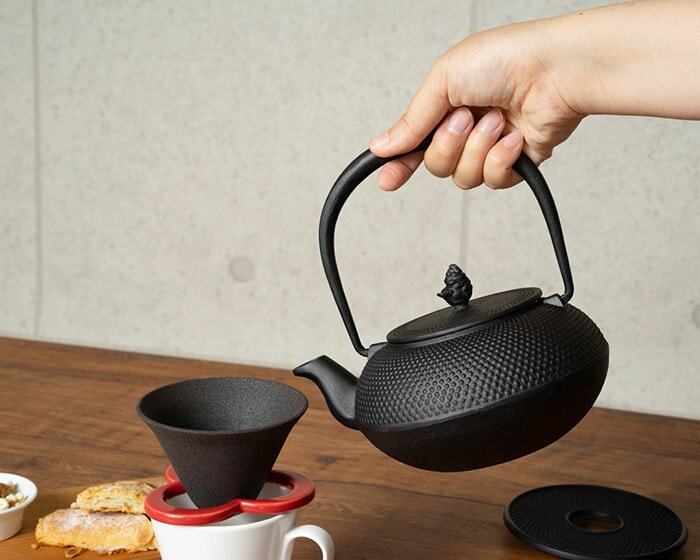 If we can take necessary iron by drinking tea with boiled water by tetsubin, or eating dishes cooked with the hot water, why not starting use it? If you feel languid despite taking enough rest, you may need iron more. 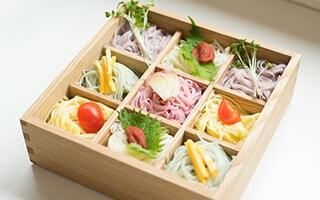 So, we recommend stylish tetsubin of Nanbu tekki for you. There are 2 types of iron we can take in daily life. Vegetable food such as spinach or grain includes “trivalent iron ion (Fe3+) (non-heme iron).” Fish or meet includes “bivalent iron ion (Fe2+) (heme iron)”. These 2 kinds of iron are different in the absorbency into human body. The absorptivity of non-heme iron is less than 5%, on the contrary, that of heme-iron is 15~30%. Heme-iron is easier to be absorbed than non-heme iron. The boiled water by Nanbu tetsubin includes “heme-iron.” So, we can take in high-absorbency heme-iron with tetsubin of Nanbu tekki. Do you worry that “is it hard to care Nanbu tekki or tetsubin”? We believe many people think that way. In fact, it is not so difficult! Just use the tetsubin as same as general kettles. There are only 2 tips for long use. Nanbu tetsubin is a tool that you use and grow it. White fur and oxide film that piled inside keeps tetsubin away from rust and make water delicious. They are necessary layer for drinking delicious water. 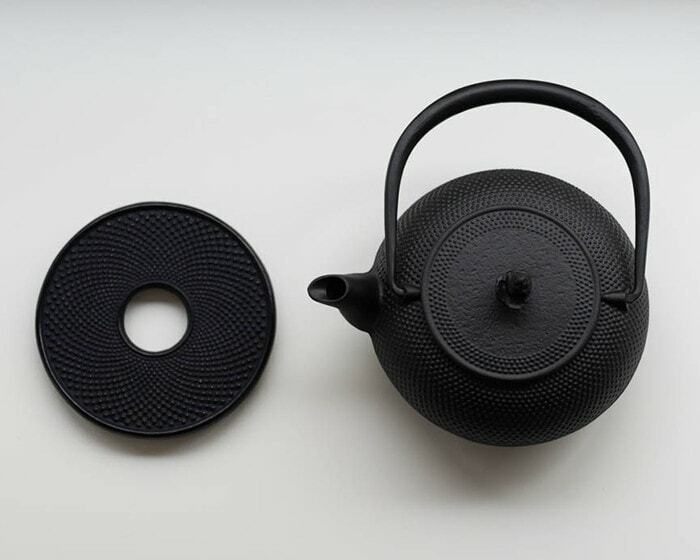 If you touch or wash the inside of tetsubin, the oxide film gets damage. During shakedown period, you can see brown polka dots or lines. But do not worry. That is not red rust. Don’t touch or rub inside, just use Nanbu tetsubin! 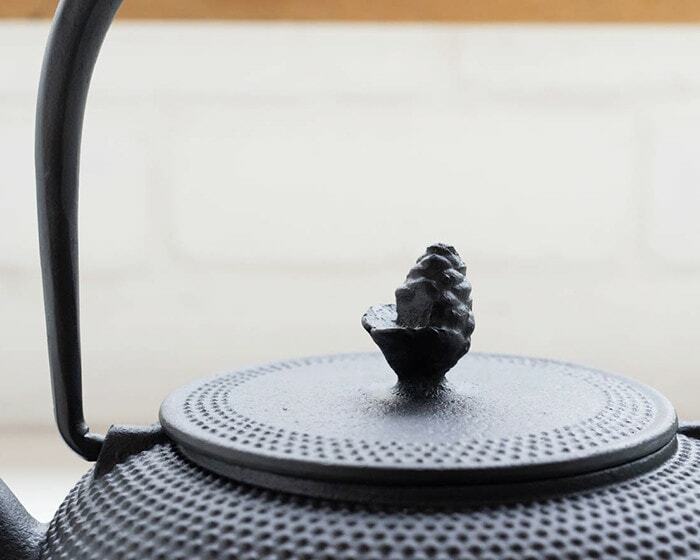 After you boil water, you need to dry tetsubin well. 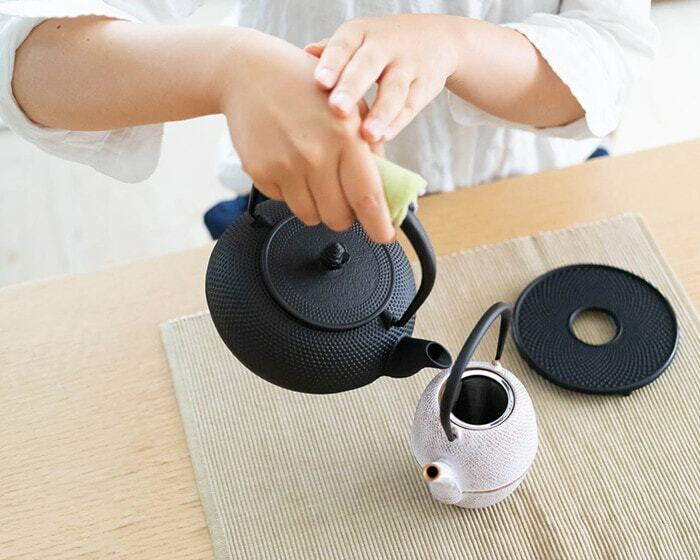 When the water boiled, pour all hot water into pot or teapot, remove lid, and dry tetsubin kettle well. You can dry the tetsubin with remaining heat. Also, you can boil Nanbu tetsubin of Roji dry over open fire. Some of you may worry. 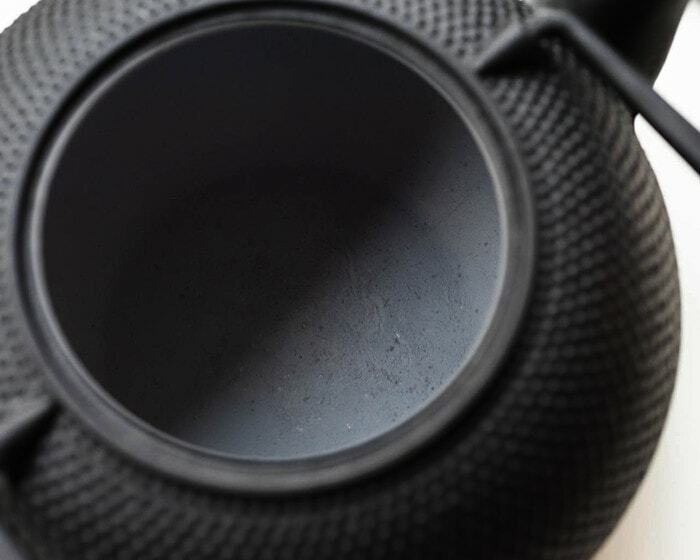 To conclude, Nanbu tetsubin can be oxidized or corroded. Nanbu tetsubin is made of iron. No Nanbu tetsubin does not get rust. 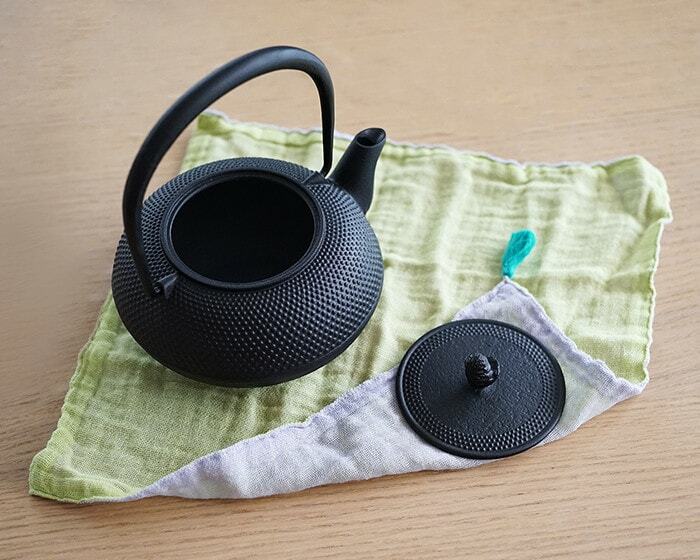 However, the more you use Nanbu tetsubin, you do not have to worry about rusting. Please do not care too much about rusting, but use Nanbu tetsubin every day. That is the best care for tetsubin of Nanbu tekki. Why Nanbu tetsubin becomes stronger against rust as we use it? In this “Kama-yaki” finishing, put Nanbu tetsubin into charcoal fire around 800~1000℃. The tetsubin is burned until it gets bright red. This process makes oxide film on the surface of Nanbu tetsubin. That oxide film prevents tetsubin from rust. This oxide film has another name “black rust.” The black rust (Fe3O4) keeps tetsubin away from red rust or metallic taste. The Nanbu tetsubin of Roji is finished with “Kama-yaki.” You can use it for a long time at ease. “Arare” of Nanbu tetsubin of Roji can be used over open fire. In addition, it is Induction cooktop safe! You can boil water on the top of oil stove in winter. Since the Nanbu tetsubin “Arare” is both open fire and induction cooktop safe, it is great item as gift. You do not have to ask the recipient of gift whether they use gas or induction cooktop. However, if you use the Nanbu tetsubin “Arare” over 200V induction cooktop and high flame, the bottom of tetsubin may change its shape. When you use tetsubin of Nanbu tekki over induction cooktop, please keep it low ～ middle flame. 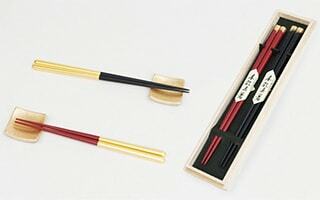 If you are beginner of tetsubin, we recommend using it with low flame. * Amime of Nanbu tetsubin of Roji is NOT induction cooktop safe. 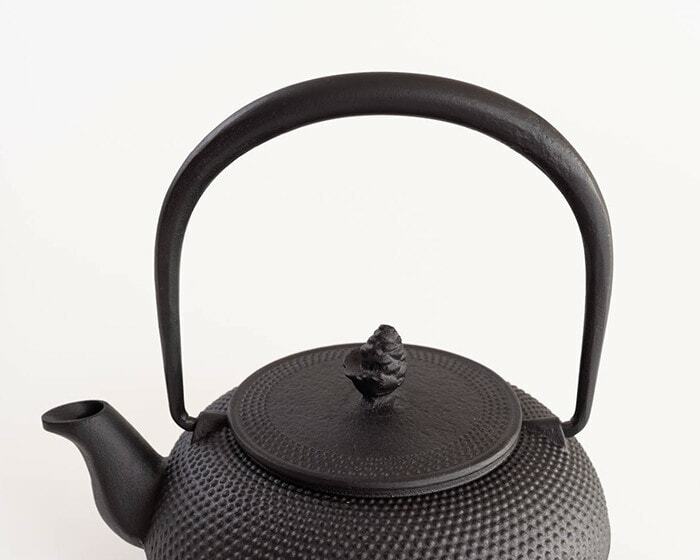 The handle of this Nanbu tetsubin has smart form. the handle becomes skinnier towards the kettle. Simple, but stylish form gives elegant atmosphere. This handle is foldable to either side. 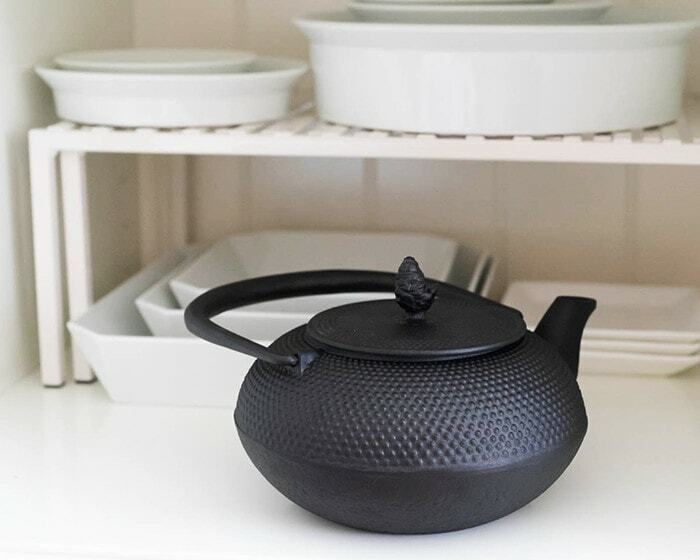 When you store the Nanbu tetsubin, it can be stored neatly in cupboard. 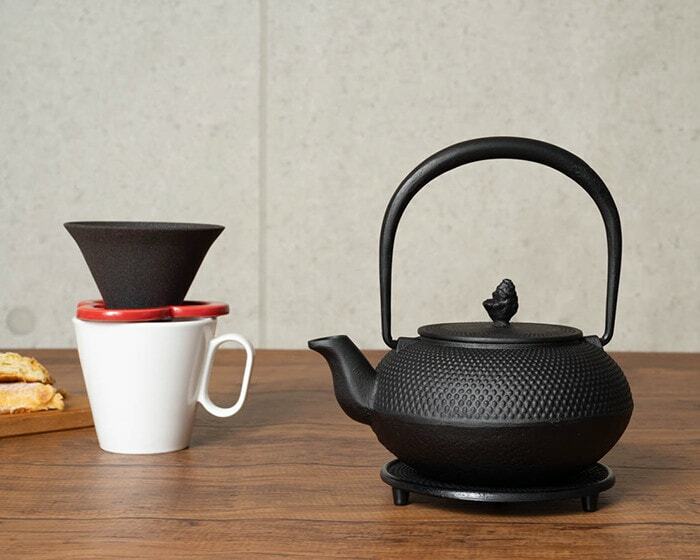 If you like green tea or black tea, how about color tetsubin teapot of Roji with Nanbu tetsubin? 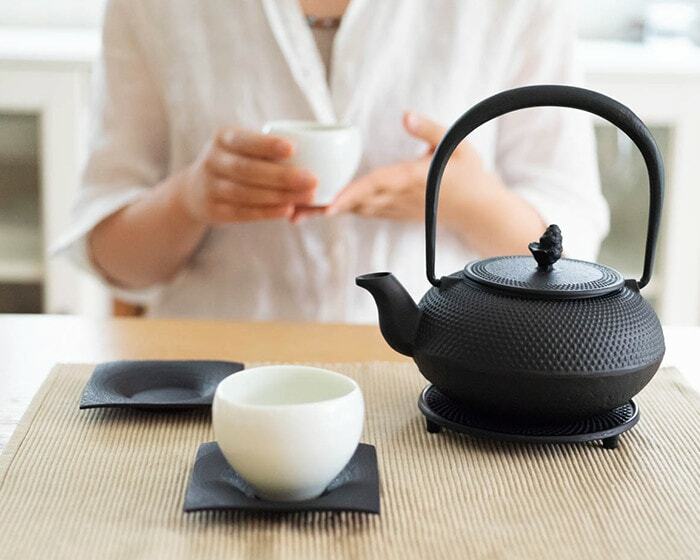 When you boil delicious hot water with Nanbu tetsubin, use a good teapot for more delicious tea. 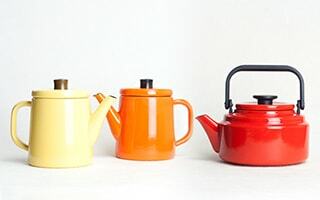 Color tetsubin teapot of Roji is also a Nanbu tekki. 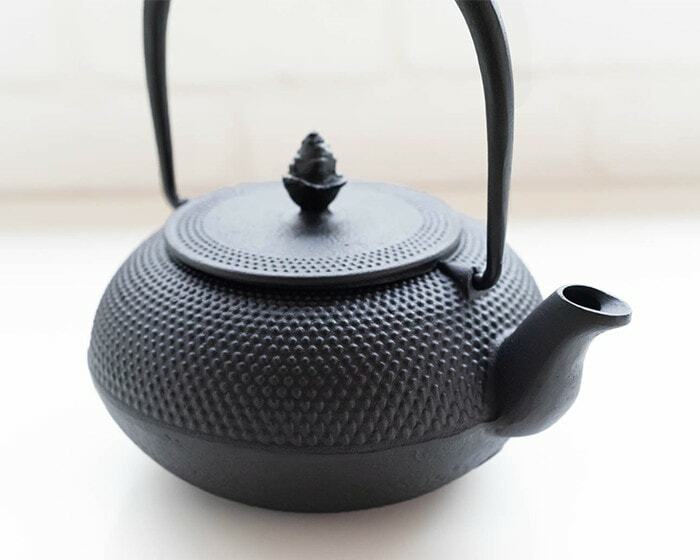 Since it is cast iron teapot, the color tetsubin teapot can keep warmth well. 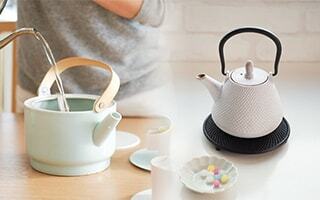 You can enjoy making delicious tea with tetsubin kettle and tetsubin teapot. The color tetsubin teapot is enameled inside. So, you cannot use the teapot over open flame. However, you can make delicious tea in adequate temperature of hot water. 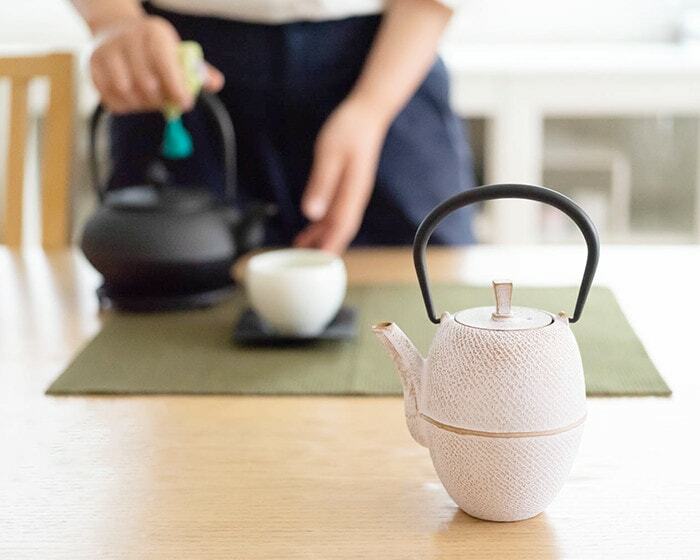 The design of color tetsubin teapot is like a miniature of Nanbu tetsubin kettle. 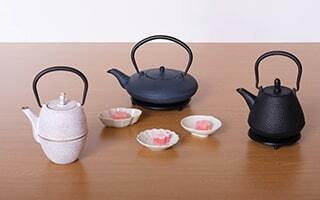 You can enjoy a great teatime with kettle and teapot of Nanbu tekki. 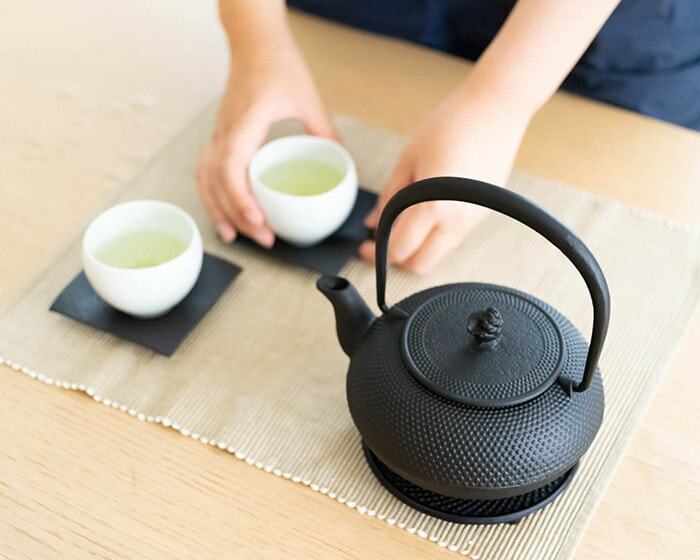 With stylish Nanbu tetsubin of Roji, the stylish cast iron trivet of Roji is also recommended. The pattern of the trivet is also Arare pattern. 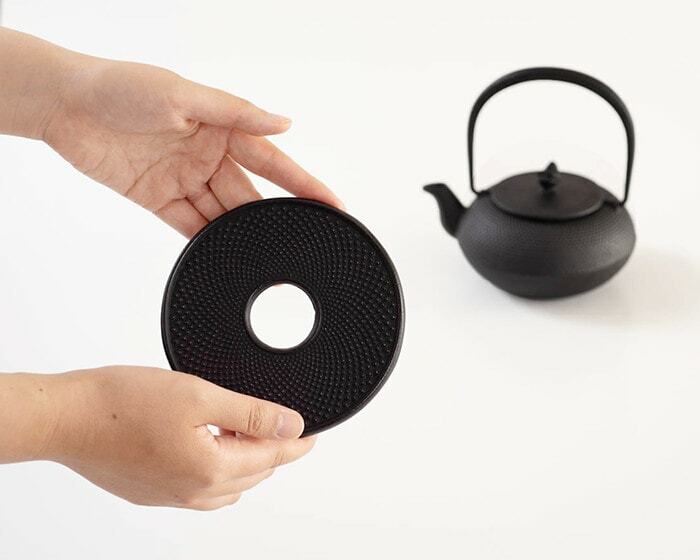 When you put hot Nanbu tetsubin on the table, the trivet keeps table away from getting burnt. The legs of cast iron trivet are covered with resin. The material of the resin is nylon 66 with glass fiber. The nylon 66 has high heat-resisting property. The resin makes legs non-slippery on the table. 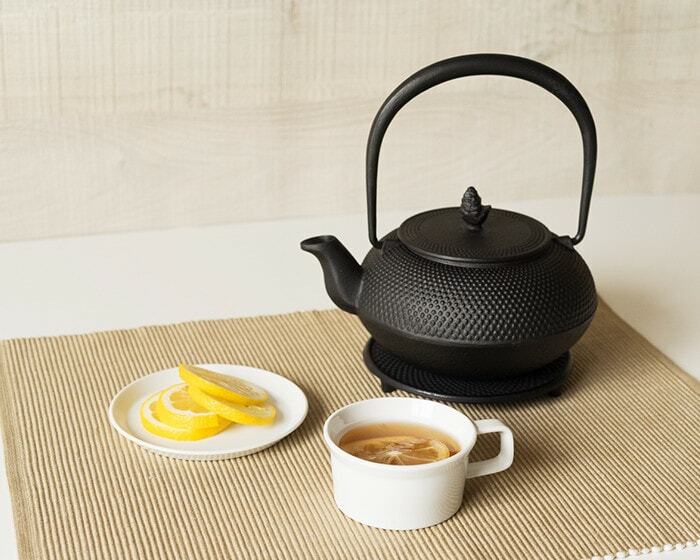 You can put hot Nanbu tetsubin on the trivet at ease. 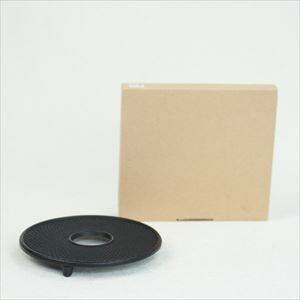 For the Nanbu tetsubin Arare of Roji, cast iron trivet L is suitable. 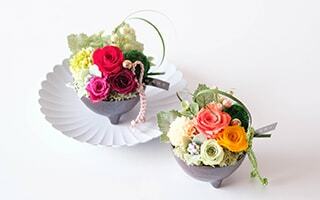 If you use the Nanbu tetsubin and trivet together, you can make stylish atmosphere on the table. Send Nanbu tetsubin as gift? 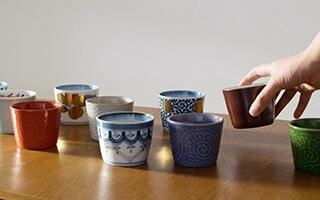 Leave it to Japan Design Store! 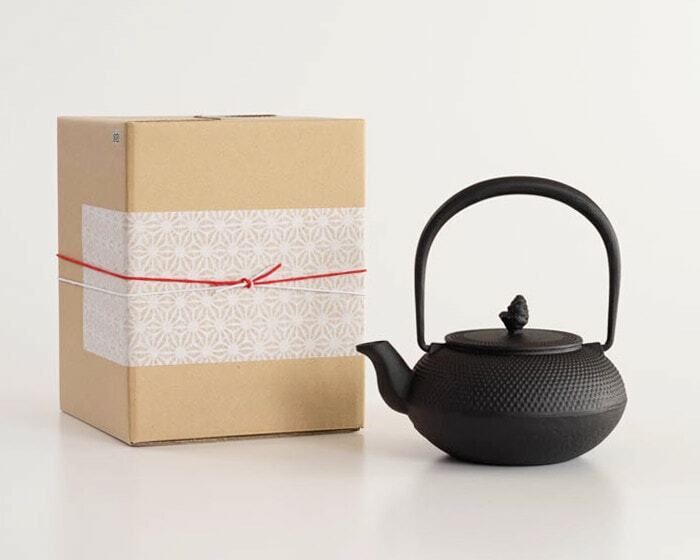 If you would like to send Nanbu tekki or Nanbu tetsubin as presents, leave it to Japan Design Store! 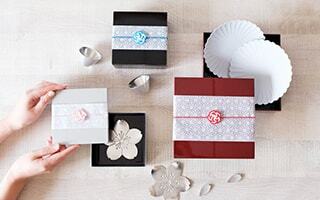 Nanbu tetsubin of Roji can be a reward for yourself, and stylish gift for your dearest people. 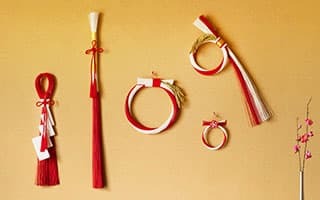 For wedding gift, housewarming gift, birthday gift, or retirement gift, how about this tetsubin of Nanbu tekki from Roji? 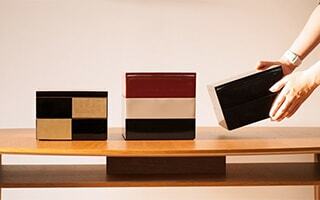 Japan Design Store offers free shipping to Japan, and various gift wrapping. 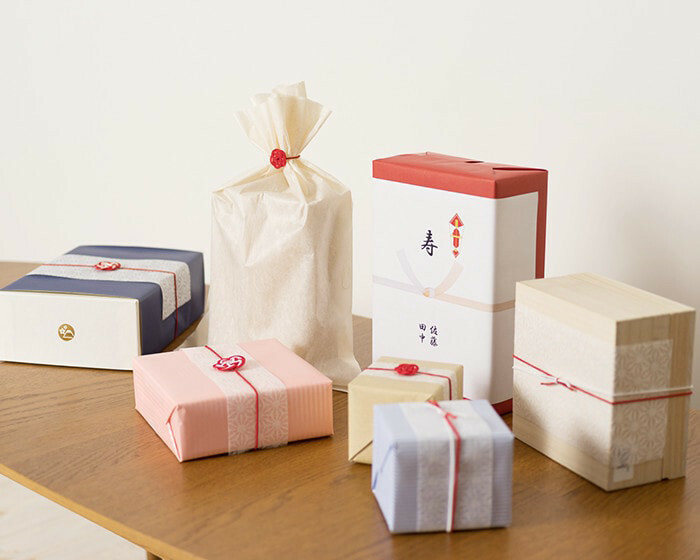 You can choose Japanese classical style gift wrapping “Noshi”, too. 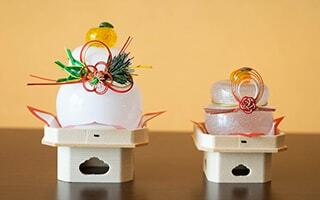 Beautiful easy wrapping and Ume-Mizuhiki have been popular. 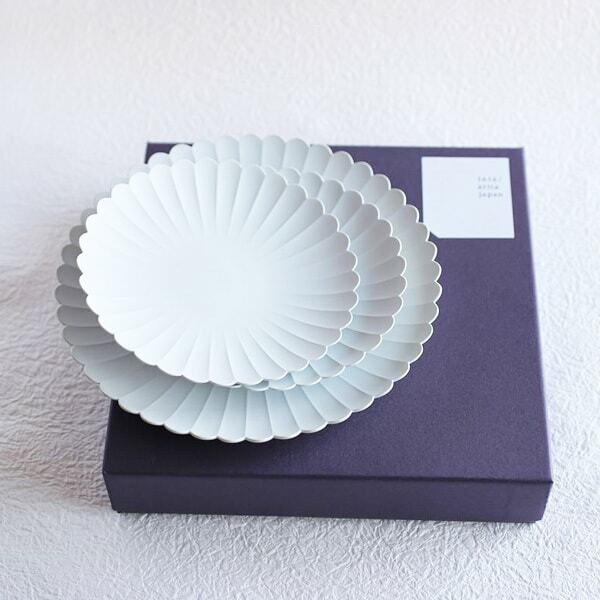 Moreover, Japan Design Store offers our original English description paper. 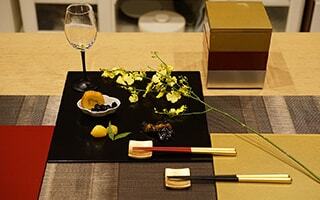 Originally, Roji Associates does not offer English description for the Nanbu tetsubin. Our staff makes English description for the customers in the world. Please choose the item at ease. * Only “Arare” of Nanbu tetsubin of Roji is induction cooktop SAFE. 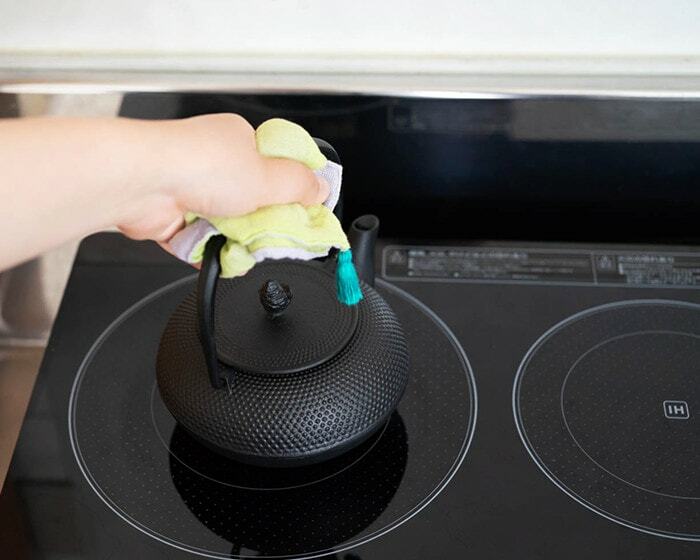 When you use tetsubin over Induction cooktop, please remain the flame in low ～ middle. * The inside of tetsubin is finished by “Kama-yaki (Kanake-dome)”. It has oxide film. The oxide film prevents tetsubin from rust or metallic taste. * When you use the Nanbu tetsubin of Roji at the first time, repeat boiling water and discard it for 3 times. The inside will be cleaned. * DO NOT rub with scouring brush, or wash with detergent inside tetsubin. Also, do not touch inside tetsubin with your fingers. 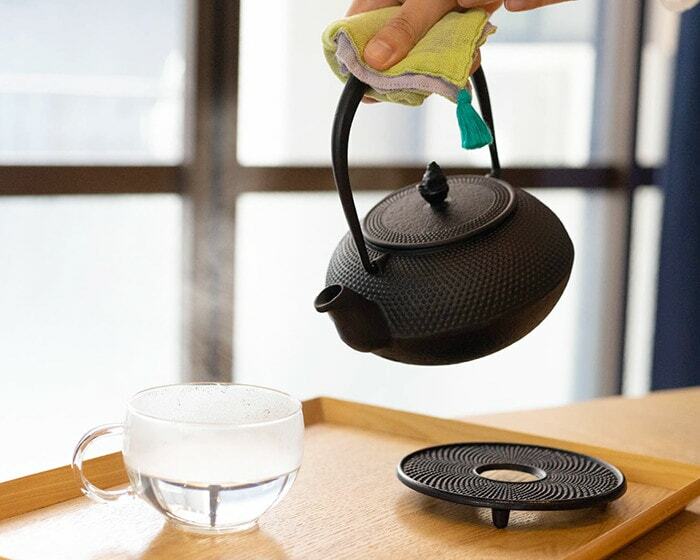 * When you boil Nanbu tetsubin, slide the lid a little, and release steam. * Just heated Nanbu tetsubin is extremely hot. Please be careful of touching it. When you grab handle, use dish cloth or pot holders. When you pour hot water, hold the knob of lid. If the lid drops, hot steam will burn your hand. * DO NOT cool Nanbu tetsubin rapidly, or leave it to cool place after use. It may cause damage to the tetsubin. 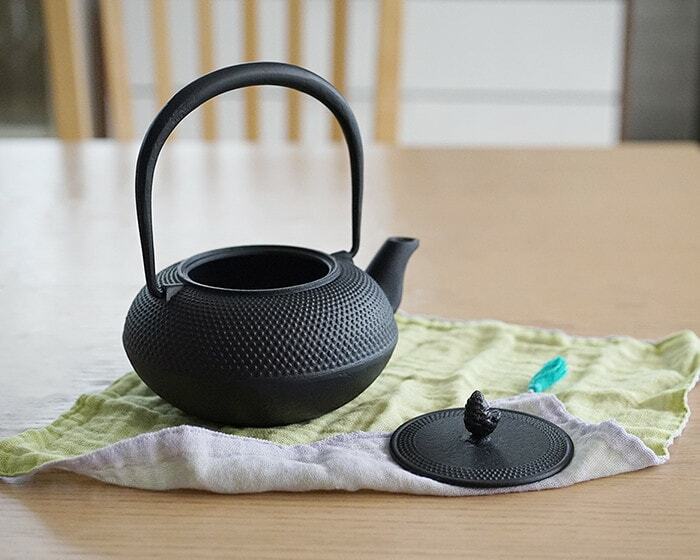 * After using Nanbu tetsubin, remove lid and dry completely with remaining heat. Or, you can boil the tetsubin dry lightly. * Spout, edge, and the backside of lid easily get rust. After use tetsubin, please wipe there with dry cloth well. When those places get rust, wipe there with tea-soaked cloth. 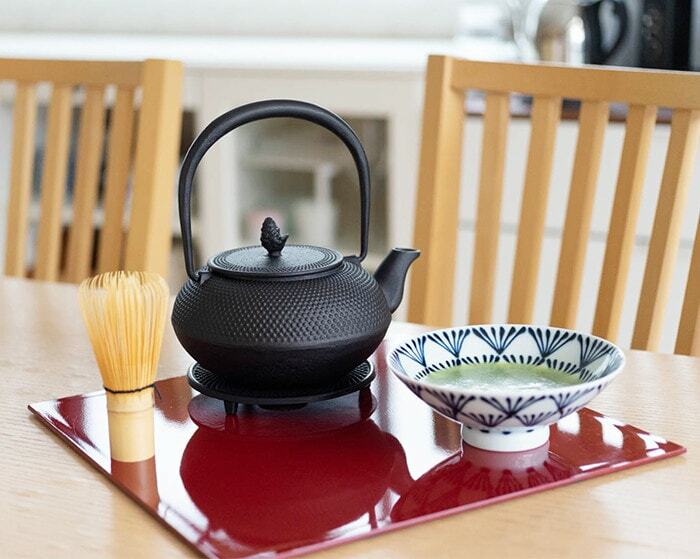 * The more you use Nanbu tetsubin, the more furs adhere inside and the furs prevent tetsubin from getting “red rust.” As the components of water adhere on the fur, you can enjoy more delicious hot water. Please do not rub off the fur. 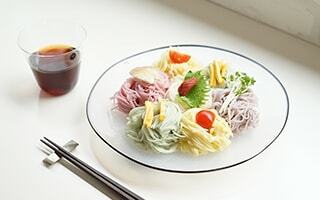 * When you do not use Nanbu tetsubin for a long time, dry tetsubin well and wrap it with highly hygroscopic paper such as newspaper or Japanese paper. Store the Nanbu tetsubin in dry place. 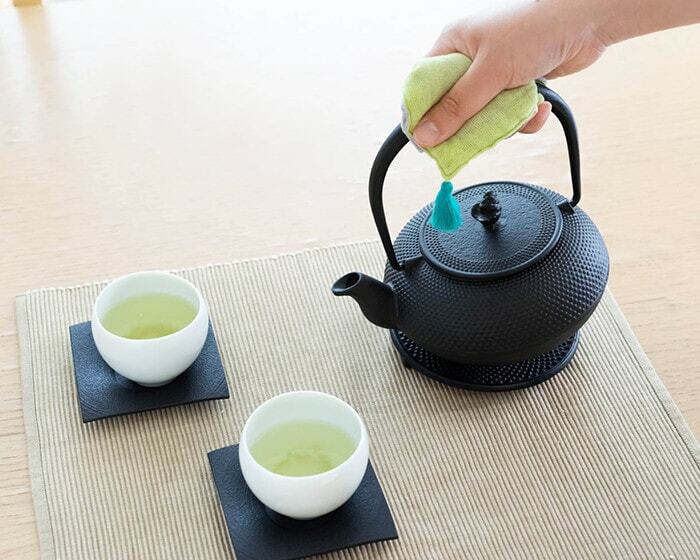 * For the care of the surface of Nanbu tetsubin, please use tea-soaked cloth. Wring out the cloth well, and polish tetsubin with it while tetsubin is warm. It brings fine gloss to the Nanbu tetsubin. 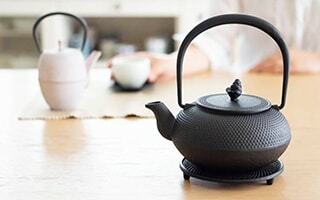 * If the hot water becomes reddish or has metallic taste, or you can see “red rust” inside the Nanbu tetsubin, boil water with packed used tea leaves until the water becomes black. You must use the USED tea leaves. Tannin of tea and iron are united, and become tannic iron. The black coat of tannic iron restrains the progress of rust inside the Nanbu tetsubin. 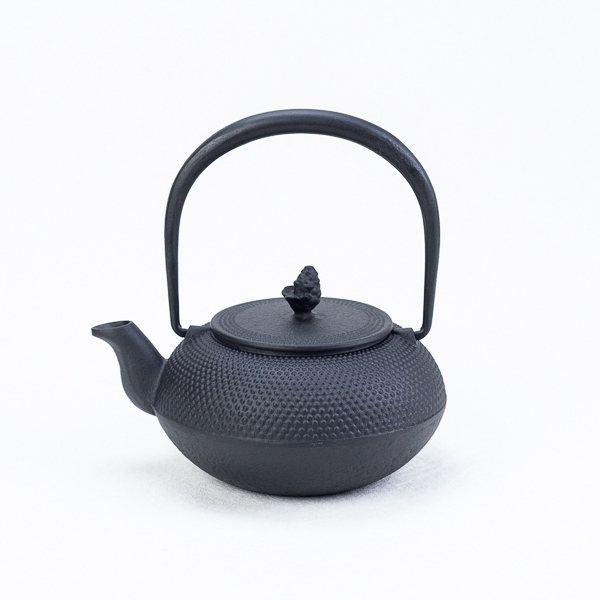 * The coating at the joints of kettle and handle will be removed naturally as you use Nanbu tetsubin. That place may get rust slightly. If the joint get rust, apply vegetable oil a little, and wipe there.